As promised, here is Part 2 of last weekend's racing excitement, Part 1 can be found here. Racing was not done for the weekend, even after Saturday's adventure. 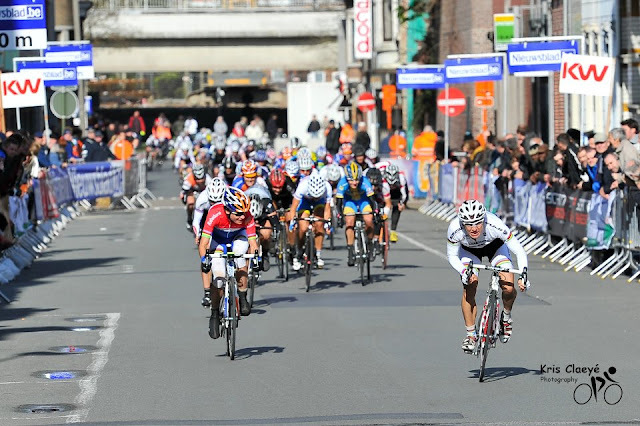 We drove straight back to Belgium after the race and prepared for the next event, GP Stad Roeselare. 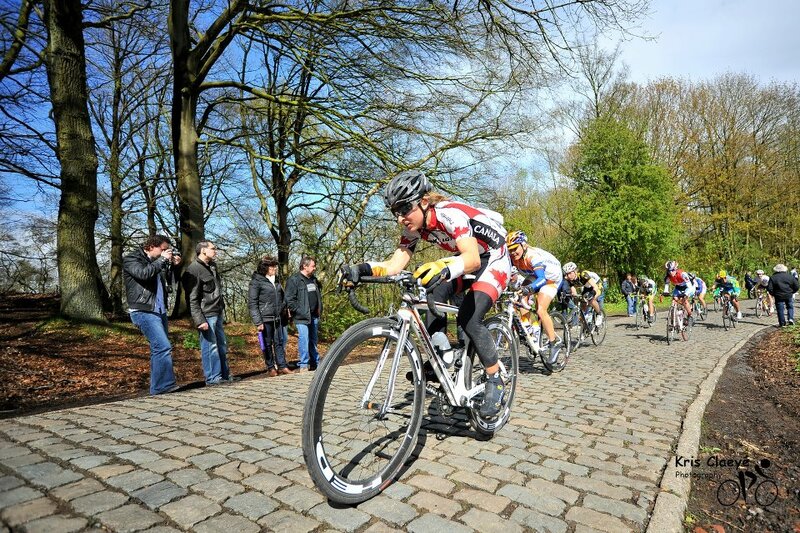 This race was completely different from Omloop van Borsele, mainly the course profile showed some elevation change! There were nine climbs on the course profile, including the famous Kemmelberg cobbled climb. It averages 11% and pitches to 20%, making for a very steep ascent. With girls swerving left and right, you really want to stay upright and on your bike because running is not much fun. I awoke Sunday morning to the blazing sun in my eyes. My first reaction was to be annoyed, but wait, sun- not rain- sun! However I was once again fooled by the weather. Race start times in Europe are quite relaxed for the most part. It is highly unusual to start a stage before noon, and even that is pretty early. Of course the clouds started rolling in as we showed up to the start. Sheets of relentless rain soon followed. I just sat in the van suffering horrible flashbacks of yesterday’s experience, and piecing together how to render myself completely rain and wind proof. Thankfully the rain let up before the start. But having learned a lesson yesterday, still insisted on racing with my leg warmers, long gloves and a rain jacket for good measure. I was pretty toasty after about 10 minutes of racing and covering early attacks. The rest of the peloton must have felt the same way because everyone was quickly pealing off layers. An Australian was allowed to ride off the front, and the pack assumed a steady pace, the race would happen on the climbs starting 30 km in. This first part was very dangerous in the pack since the roads were slick from rain. I experienced this first hand when I slid out first wheel through a corner. There are many things I am thankful for concerning this crash #1. Nobody ran into me #2. My extra rain layers and slick road minimized any road rash #3. Didn’t even have to chase back on since I crashed at the front and the pack was 200 riders deep. Fortunately I was back on the bike in no time, and really more embarrassed than anything. 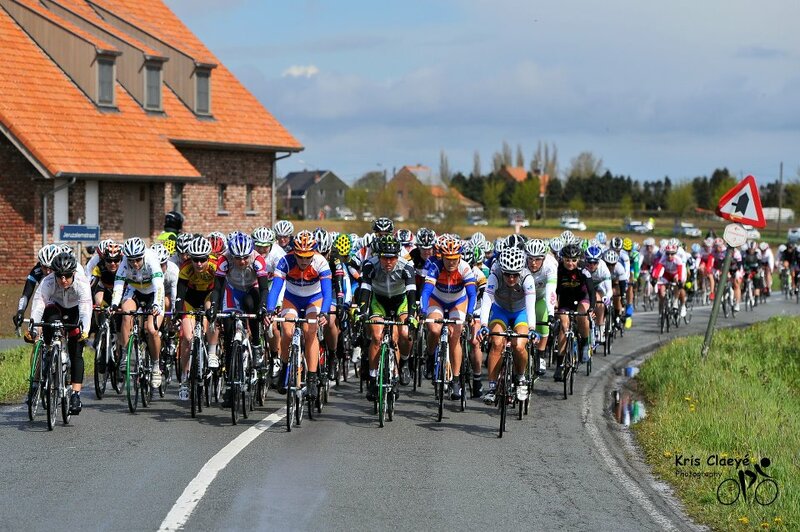 Back on my bike and in the peloton, it was time again to focus. Needed to make it to the front before the climbs. A crash right before the climbs at a round about sent me chasing again, making it to the main bunch right before the Kemmelberg appeared. I felt strong climbing and weaved through riders swerving left and right. 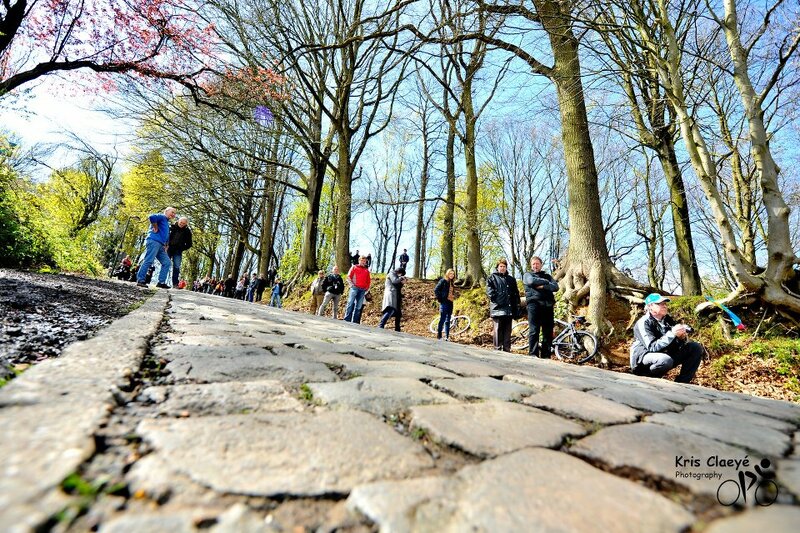 Fans lined up on the climb gave helpful pushes to those who had veered off course. Cresting the top of the climb, I found that I was with a small group of riders just off of the front selection. Since Joelle had made the first group, Denise and I were happy to let others work to bridge the gap. It took a little while, but we did finally reconnect with the front group. I was just getting comfortable and into a rhythm, when suddenly either the girl in front of me braked too hard, or I braked too late approaching a corner. Either way, I suddenly turned into a ping-pong ball, bouncing off riders left and right, and finally flew head first into a mud and water filled Belgian ditch, how lovely! I was very thrown off by this crash. Two crashes in one day? I hadn’t even crashed yet this season. I guess everyone has off days. I pulled myself and my bike out of the ditch to assess the damage. My brake lever was definitely pointing 180 degrees in the wrong direction. Hmm it appeared quite broken. Neutral rolled up and checked it out, somehow they managed to put it in its initial place. I was convinced it was broken and would need a new bike. They told me to keep riding and the car would eventually come, then off they sped leaving me in the middle of a field. The unfortunate part about hilly races and racing on small roads, is that the caravan can end up really far back when the race splits up. They barrage the cars so that dropped riders cannot draft the cars to get back on. I started riding alone and pretty frustrated. However, upon testing my shifter, I discovered that it still worked! It wasn’t the easiest thing to operate with a broken shifter, but it would have to do..brakes only slow you down anyways. I was soon caught by the second large group. I was frustrated riding with this group, thinking that the race was up the road and I really couldn’t be much help to the team in this position. In an unusual turn of events, my group actually caught back onto to the first group, looked like I could actually be of some help! Upon joining this group, I was informed that a group of three riders were now up the road with a very large lead, they would stay away until the end. Annemiek van Vleuten was the champion of the day. The race finished with three very technical circuits winding through a city. Rhae and Denise did a good job covering and attacking through the circuits. I started to feel the effects of crashing twice, and didn’t feel too confident operating my broken brake lever through the tight corners. I was determined to make it up to the front by the end to help Joelle with the sprint for 4th. It was a bit chaotic navigating the final kilometers. No teams had a solid lead out set up, so all the sprinters jockeyed for position. I ended up on the front with 2 km to go, but was overtaken out of the corner. In the mess I lost Joelle and hoped she found a good wheel. A final corner took us to 300 m to go on a slight uphill drag. I finished 8th in the bunch, for 12th overall. Still have much to learn, but feel more comfortable fighting for position coming into those big bunch sprints. Next stop is Luxembourg this weekend for the Festival Luxembourgeois du cyclism feminin Elsy Jacobs, a three day stage race (prologue + 2 road races). I love Luxembourg so it should be a good time!